The Speedy Sweep® Cordless Battery Operated Sweeper, is lightweight, powerful, and quiet. The Speedy Sweep® can be used on any floor surface: carpet, concrete, hardwood, tile, linoleum, marble…it can even be used on a boat as water won't hurt it. 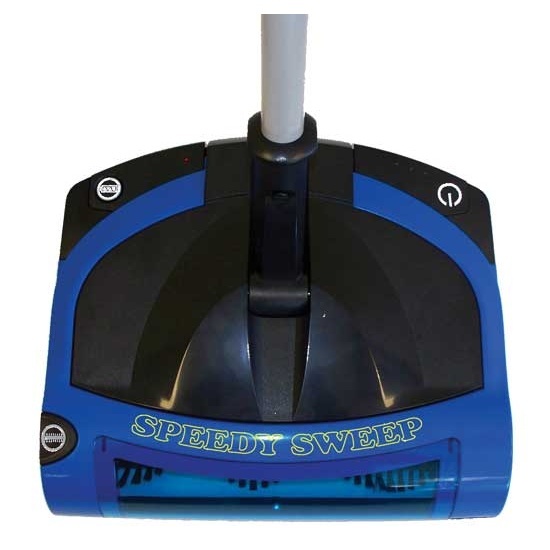 The Speedy Sweep® employs a nickel-metal hydride battery that runs up to 90 minutes on a single charge. The powerful brush roller sweeps dirt and bulkier items into its 17 ounce see-through dustpan, which is easily removed for emptying. The Speedy Sweep® comes with a wall mount, a compact power adapter and a self-cleaning pet brush roller. The unit has a sweeping path of 12", weighs under 5 lbs, non-marking wheels, and comes with a 1 year limited warranty.